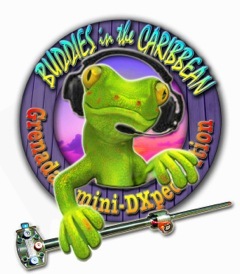 Hard to believe another year of adventure has gone by and now, Feb 1-9th, the Buddipole Adventure Team #1 will be in J3/Grenada for a mini-DXpedition including a number of daytrip, backpack, battery-only portable "eco-operations" to scenic mountain tops or beaches. Each February, the Buddipole Adventure Team #1 travels to a new Caribbean island as part of a 100 lbs or less, "suitcase DXpedition" and run HF 100-watt stations from a northerly-facing, hilltop Villa. Each day the more adventurous team members head out to explore the scenic vistas of the island and to operate portable with backpackable radios and the Buddipole antenna system. The team members are: Chris/W6HFP, Budd/W3FF, Steve/wG0AT, Paul/KB9AVO, Mike/KC4VG, Wey-Bob/K8EAB, Bill/W7ZT, and Guy/N7UN. We expect to have J38xx callsigns. Follow us on the DX Cluster or for up-to-the-hour posts at http://groups.yahoo.com/group/BuddipoleLIVE/. Hope to work you from J3!